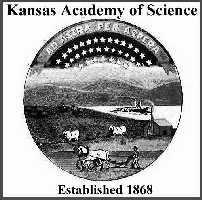 LEFT: Professor Benjamin F. Mudge - one of the founders of the Kansas Academy of Science. Photograph from frontispiece of the The University Geological Survey of Kansas, Vol. 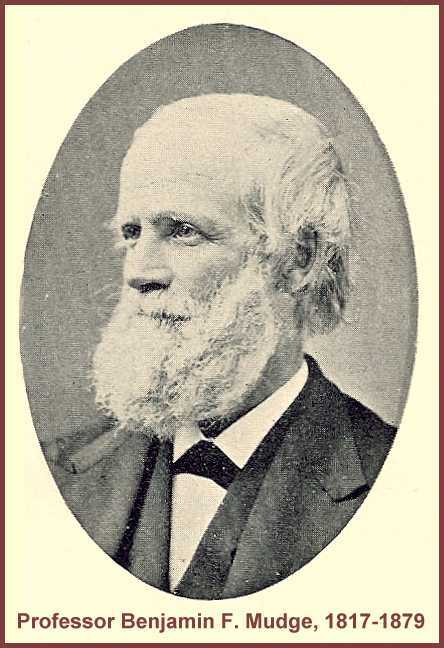 2 with the following notation by S. W. Williston: "To the memory of Prof. Benjamin F. Mudge, the first State Geologist of Kansas, An excellent teacher, a faithful friend, an honest man." Join Cope, Marsh, Williston, the Sternbergs, H. T. Martin and the many others who have reported on fossils from the Midwest. Beckemeyer, R. J., Museum Associate, Natural History Museum (Entomology Division), University of Kansas, Lawrence. MORPHOLOGICAL PARAMETERS OF WELLINGTON FORMATION INSECT WINGS. Insect wing morphology can be characterized by various geometric parameters, such as length and width. Traditional measures of wings as aerodynamic surfaces, such as Aspect Ratio, a measure of the slenderness of a wing, can be computed for insect wings as well. In 1984 biomechanicist C. P. Ellington of Cambridge University developed a series of measures of the spanwise distribution of wing width, showed that the measures were allometrically related, and discussed how they might be interpreted in terms of flight parameters. A sample of Wellington Formation insect wings have been analyzed; these data will be presented and comparisons of these morphological parameters for the Wellington Formation Permian insect assemblage will be compared with Ellington's data for extant insects. Martin, L. D. and *D. A. Burnham, Department of Ecology and Evolutionary Biology and Museum of Natural History (BRC), University of Kansas. PREDATORY BEHAVIOR IN A FOUR WINGED DINOSAUR-LIKE BIRD. The four-winged dinosaur-like bird Microraptor, has flight feathers on its feet fully comparable to the primary flight feathers of the front wing. These feathers preclude any hope of normal progression on the ground and establish that it was completely arboreal. Similar-sized, but unfeathered predators, the compsognathid dinosaurs, (Compsognathus, Sinosauropteryx), are often found with well-preserved skeletons of prey (lizards, small mammals) in the stomach region. This has occurred in nearly half of the discoveries (at least eight) of these animals, indicating that they typically caught small terrestrial animals and swallowed them whole. We have examined over twenty skeletons of cf. Microraptor without finding any evidence of their prey suggesting that they dismembered it, swallowing chunks of flesh with very little accidental inclusion of bones in the process. In that case the prey was probably larger in comparison to the predator than that swallowed by the compsognathids. We suggest that microraptors were specialized predators on other arboreal animals and that they specialized on contemporary birds many of which had claws on the hands for tree trunk climbing. We think that they caught birds (Confusciusornis) in the process of climbing a tree trunk, glided to a point behind it, seized and killed it, then carried the carcass to a branch where it was systematically dismembered. *Elder, R. and L. D. Martin, Department of Ecology and Evolutionary Biology, University of Kansas LONGISQUAMA INSIGNIS AND THE ORIGIN OF AVIAN PLUMAGE. The discovery of the four-winged feathered dromaeosaur, Microraptor, fulfills Beebes prediction that bird flight originated in a sprawling four-winged glider. One of the criticisms leveled by Heilmann against Beebe was the existence of elongated feathers in the spinal tract of young pigeons paralleling those on the femoral tract used by Beebe as ontogenetic support for his model of flight origins. However Heilmanns criticism lost most of its force with the discovery that the Lower Cretaceous dinosaur-like bird, Microraptor had the femoral tract modified into a fully formed hind wing just as Beebe had suggested. Heilmanns comment seems prophetic when the elongated spinal tract feathers forming the unique thoracic wing of the small Triassic archosaur, Longisquama are taken into consideration. These elongate feathers are similar to and probably serially homologous with the elongated feathers on the tail of Archaeopteryx. As suggested by Martin, flight may have arisen in a small sprawling arboreal glider with a thoracic wing. As feathers developed on the front legs and a power stroke developed to facilitate landings, the thoracic wing was reduced with the tail of Archaeopteryx representing a later stage in that pattern of reduction. Everhart, M.J., Sternberg Museum of Natural History Fort Hays State University. PROBABLE CAUSE OF DEATH OF THE HOLOTYPE SPECIMEN OF TYLOSAURUS KANSASENSIS (SQUAMATA; MOSASAURIDAE) FROM THE SMOKY HILL CHALK, WESTERN KANSAS. 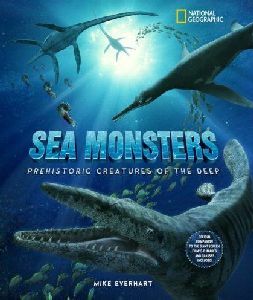 Mosasaurs are large marine reptiles that flourished in Earths oceans during the last 25 million years of the Late Cretaceous. The largest species grew to adult lengths in excess of 15 m near the end of the Maastrichtian. 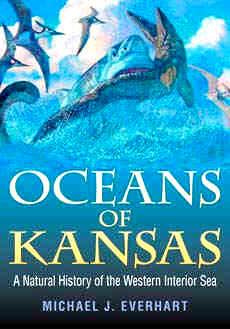 Aside from Great white-sized sharks such as Cretoxyrhina mantelli, there are no other marine species known from that time which could challenge the role of mosasaurs as apex predators. From the evidence of the injuries observed on the remains of mosasaurs since their discovery, however, it appears that they occasionally fought with or were attacked by other mosasaurs. Sometimes the injuries incurred in this combat were non-fatal and healed prior to the death of the mosasaur; in other specimens, the injuries were apparently fatal. The well preserved, articulated skull, lower jaws and cervical vertebrae of the holotype specimen of Tylosaurus kansasensis (FHSM VP-2295) were collected from the lower Smoky Hill Chalk (Late Coniacian) in Ellis County in 1968. The skull exhibits readily visible and non-healed gouges on the frontal and right dentary that are attributable to the powerful bite of a much larger mosasaur. The deep bite marks on the skull, as well as possible damage to the neck at the base of the skull, suggest that this individual died when its skull was bitten and crushed by another, larger mosasaur. Falk, A. R. (2) Department of Geology, University of Kansas. CREDIBILITY OF UNKNOWN THEROPOD TRACKS WITH AVIAN CHARACTERISTICS FROM THE LATE TRIASSIC. Melchor et al. (2002, 2006) described birdlike footprints from the late Triassic Santo Domingo Formation (Norian/Rhaetian) in northwest Argentina that are not definitively stated to be bird tracks. Rather, they are attributed to an unknown theropod with avian characteristics. The tracks from Santo Domingo differ from small theropod tracks based on the angle of divarication between toes II and IV. This angle is important in distinguishing dinosaur tracks from bird tracks since bird track divarication angles measure approximately 100° or greater and dinosaur tracks generally have an average angle of much less than 100° . Furthermore, no dinosaur track has an average angle greater than 100° (Currie, 1981). These Triassic tracks have a mean angle divarication of 115° , with a minimum angle of divarication of 87° and a maximum angle of 137° (n=49), and are clearly not within the range of known dinosaur track measurements. The tracks described by Melchor et al. meet other criteria for determining bird tracks; the tracks are wider than they are long, show a posteriorly-directed hallux impression, and are visually reminiscent of modern bird tracks. The Melchor et al. Santo Domingo tracks extend the trace fossil record of Mesozoic birds from the Cretaceous to the Triassic. This implies that the evolutionary origin of birds can now be considered Triassic in age, much older than Archaeopteryx from the Jurassic Solnhofen Formation (Kimmergian/Tithonian). *Hageman1, S.A., T.J. Northcutt2, and B.L. Hoffman1. 1Department of Natural and Physical Sciences, Park University, 2Paleontologist, Mission, KS. PRELIMINARY ANALYSIS OF THE BIODIVERSITY OF THE BONNER SPRINGS SHALE (LAGERSTÄTTEN? ), PARKVILLE, MO. Exceptionally well-preserved plants and insects occur in the Bonner Springs Shale (Upper Pennsylvanian, Kansas City Group). The flora is represented by 15+ genera. Odontopteris, Neuropteris, Cordaites, and Calamites (Annularia and Asterophyllites) are commonly present with Asolanus, Aphlebia, Alethopteris, Pecopteris, and Sphenophyllum also represented. The lycopods are represented by leaves (Lepidophylloides), microsporangiate (Lepidostrobus) and megasporangiate (Lepidostrobophyllum) cones. Fossils resembling megasporagnium have been discovered but are interpreted as egg cases. These cockroach oothecae are 2 cm in length and correspond with cockroach wings (2-3 cm) in the unit. Twenty specimens of insect wings and oothecae represent three Orders; O. Paleodictyoptera, O. Blattodea (cockroaches), and Order Plecoptera (stonefly). The cockroach genus Sysciophlebia is the most common with some representing new species. The depositional environment of the Bonner Springs Shale at this locality indicates a floodplain. Laminated deposits (sand, silt, mud) occur for 8 meters and represent a multitude of flooding events. The best preserved specimens are associated with the finer grained sediment but the outcrop is fossiliferous throughout with the lowest meter being most productive in diversity. This locality provides the opportunity to reconstruct a tropical biome for the flora and the insect population associated with it and may eventually reveal additional insects or arthropods making its classification as a lagerstätten plausible. Morales, M. and K. Moore, Earth Science Department, Emporia State University. FOSSIL MARINE INVERTEBRATES FROM THE UPPER PENNSYLVANIAN (VIRGILIAN) SEVERY SHALE FORMATION NEAR MELVERN LAKE, KANSAS. The Severy Shale Formation is the lowest formation of the Sacfox Subgroup, which is the lowest subgroup of the Wabaunsee Group of Kansas. The Severy rests unconformably on top of the Topeka Limestone Formation and is overlain by the Howard Limestone Formation. Thus the Severy is of Late Pennsylvanian (Virgilian) age. Although the formation is reported to have only "sparse" fossils in its uppermost part, a rich locality north of Melvern Lake in Osage County contains an abundant and diverse assemblage of marine fossils. The fauna includes the following genera: fusulinid foramiferan Triticites; rugose coral Lophophyllidium; bryozoans Fenestella, Rhombopora, Cystoporata, Fistulipora, and Tabulipora; cephalopods Mooreoceras and Tainoceras; gastropods Worthenia, Bellerophon, Knightites, Euphemites, Ianthinopsis, Strobeus, Palaeozygopleura, Straparollus, Phymatopleura, Stegocoelia, and Meekospira; bivalves Aviculopinna, Orthomyalina, Aviculopecten, Phestia, Nuculopsis, Parallelodon, and Astartella; brachiopods Neospirifer, Juresania, Derbyia, Meekella, Dictyoclostus, Marginifera, Neochonetes, Enteletes, and Composita; echinoderms Delocrinus and uncertain echinoids; trilobites Ameura and Ditomopyge. The fauna is said to also include rare isolated "shark teeth", but we have never collected any, and there are none in the fossil collections of the Johnston Geology Museum at Emporia State University. *Nabavizadeh, A. (1), L. D. Martin, and D. A. Burnham, Department of Ecology and Evolutionary Biology and University of Kansas Museum of Natural History (BRC), University of Kansas. DO DEFENSIVE STRUCTURES IN TRICERATOPS PROVE PREDATORY BEHAVIOR IN TYRANNOSAURUS? Although the extensive frills of ceratopsian dinosaurs are relatively thin and could never have resisted the full biting force of a tyrannosauridâs mouth, they may still have provided a measure of protection. In order to bite something, the predator must first introduce it into the mouth, and the adult Triceratops frill extended far beyond the gape of any tyrannosaurid. The frill also extended back beyond the vulnerable neck and upper back. Known evidence of possible Tyrannosaurus attacks have been limited to the posterior back and pelvic region. As long as the Triceratops kept its nose pointed at the attacker, a tyrannosaurid would have to reach over the front of the frill to reach the back and expose its vulnerable underbelly to the ceratopsians long horns. It is clear from this scenario that the tyrannosaurid would have had to get behind the ceratopsian, a movement that could be easily foiled by groups of ceratopsians behaving together. It would seem that Triceratops had evolved just the right tools to deal with giant, bipedal, predatory dinosaurs and the only one available was Tyrannosaurus. This defensive structure would seem to be sufficient proof that Tyrannosaurus was an active predator, although like modern large predators, it would probably scavenge when the opportunity presented. *Schumacher, B.A., Sternberg Museum of Natural History, Fort Hays State University. ON A PLIOSAUR SKULL (PLESIOSAURIA) FROM THE UPPER CRETACEOUS OF THE NORTH AMERICAN WESTERN INTERIOR. A partial pliosaur skull in the University of Nebraska State Museum (UNSM 50136) reveals anatomical features hitherto unreported for the group. Possessing only circumstantial contextual information, the specimens preservational character suggests origination from the Fairport Chalk of central Kansas. Nannofossil analysis of attached matrix will provide a conclusive temporal position. The specimen includes the muzzle and portions of the palate, minus the premaxillae, with a maximum preserved length of 102 cm. Although perhaps not taxonomically significant, the specimen is impressively large with an estimated restored skull length of 1.75 m. The vomers are elongate (61 cm) and bifurcate near their posterior termination, and are overlapped extensively (24 cm) by slender extensions of the pterygoids. The latter character has not been reported within the Plesiosauria, and given the degree of development, may be variably present throughout the group. The internal nares are formed by the juncture of the palatines, vomers, and maxillae. Also preserved are portions of the posterior palatines and jugals. Configuration of the palatal elements, in particular the elongate vomers and position of the internal nares contrasts markedly with Brachauchenius. Likewise, the specimens elongate muzzle and homodont dentition are not similar to Kronosaurus or Plesiopleurodon. With no clearly similar material for reference, the specimen may represent an undescribed taxon. Future research will likely reveal a greater diversity of Cretaceous pliosaurs than currently known. *Williams, D.W.(3), Department of Ecology and Evolutionary Biology, University of Kansas. USING LANDMARK DATA FROM THE FIRST LOWER MOLAR TO DISCRIMINATE NORTHERN GREAT PLAINS MICROTUS SPECIES. The identification of Microtus teeth in fossil sites is desirable because of their use as ecological indicators and morphological specificity. Microtus species are differentiated using the first lower molar (m1) with additional characteristics (biogeography, other teeth, skull characters, etc.) as needed. The m1 is often recovered as an isolated tooth however, so identifications based on that tooth alone are valuable. Landmark data have previously been used to successfully discriminate M. pennsylvanicus and M. xanthognathus in fossil samples. I extended this data set to include six more Microtus species and used the landmark data in a discriminant function to identify Pleistocene Microtus fossils. After jackknifing the data, the discriminant function correctly placed 87% of 130 modern specimens. When the problematic species M. montanus was excluded, the successful identification rate increased to 90%. 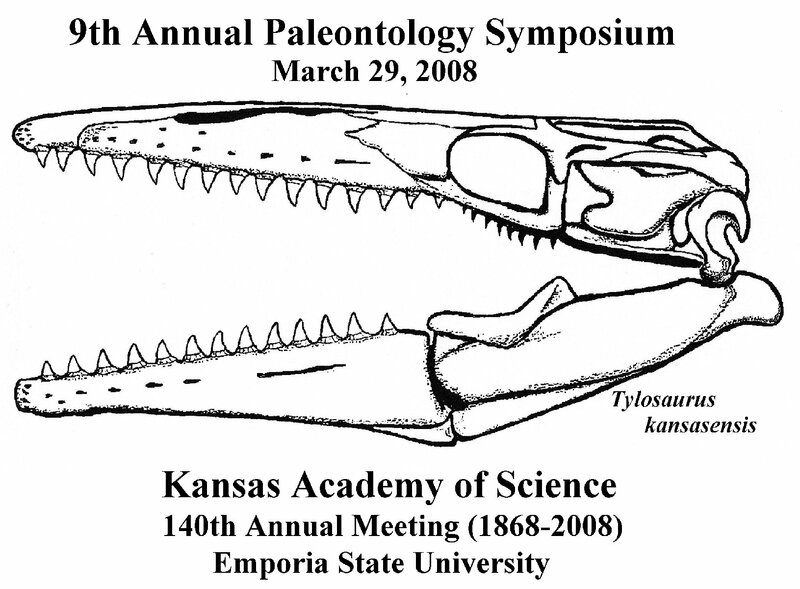 The 2007 KAS Paleontology Symposium was cancelled due to weather.